Description: (Obverse) the uncrowned left-facing profile of King George V, text around GEORGIVS V BRITT MN REX ET IND IMP; (Reverse) St George on horseback trampling underfoot the eagle shield of the Central Powers and a skull and cross-bones. Above, the sun has risen in victory. Comments: This medal was awarded to all members of the armed forces, 1914-18, in recognition of their arduous services in bringing the war to a successful conclusion. 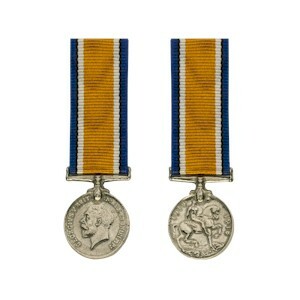 It was also awarded for service in Russia in 1919-20 and for mine clearance in the North Sea between 11th November 1918 and 30th November 1919.